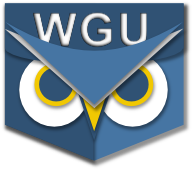 The Unofficial Mobile App for WGU Students. This website is not affiliated with, or endorsed by, Western Governors University. All names, trademarks, and products are the property of their respective owners.